LOVE NOT FOUND is a story about a young woman living in a time where touching has become outdated. She has recently moved to a new planet and finds that touching might not be such a bad idea. Now she is on a quest to find someone who wants to do things the old fashioned way! 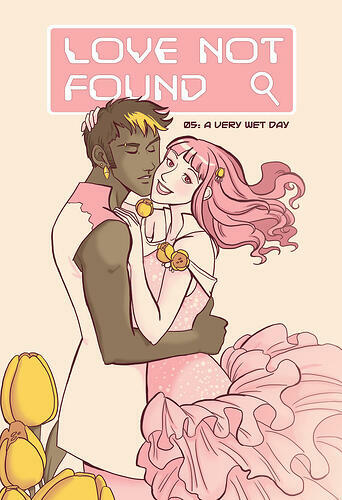 Note from Love in Panels: Love Not Found is currently updated 3x/week with one print/PDF volume available. Patreon supporters get access to bonus content, as well. LOVE NOT FOUND, by Gina Biggs, is a sci-fi romance set in a time when touching has become taboo. Main character Abeille (yes, that's French for "bee") is looking for something more than a pre-programmed session with a computer, so she sets out to find someone to "experiment" with. LOVE NOT FOUND is beautiful. The setting is Monotropa, a planet advertised as "A Nature Lover's Paradise," so Biggs has populated it with interesting plants, dryads, and tropical weather patterns. I'm an avid gardener, so I'm surely biased, but the fact that several of the central characters are botanists is fresh and interesting. The color and costume choices are sweet and fun, and reflect the flower-ful setting in which the story takes place. Characters of all gender expressions often have flowers in their hair and wear clothes shaped like or inspired by plants. Much of the comic is in shades of pink, white, and brown, with pops of yellow, green, and (rarely) blue. It's an unabashedly feminine pallette that doesn't feel childish, but rather playful. The characters are diverse and engaging, with only one recent addition I don't much care for. Abeille is from a planet called Pasque, which seems to be mostly a permafrost-type biome. We initially don't know much about her family, background, or reasons for emigrating to Monotropa, other than that she wants to plant a garden in memory of her sister. She works in the cafeteria of a company that engineers plants to resist the bugs on the planet. She appears to be white, with pink hair and dark pink eyes. Miel (French for honey, yep) works as a "logger" at that same company. His job is to log details about various species, including growth and transplant results. If he was from Earth, we would say that his mothers are of South-Asian and African descent. (They're such a fun couple and when you meet them you'll "aww.") Miel is more reserved than Abeille, and their awkward flirting is sweet and feels honest. Ivy (Abeille's best friend) and her partner, Holly, have an interesting secondary storyline. They're co-researchers at the aforementioned company, choosing to live together out of convenience and efficiency. None of that messy "romance" stuff. Their relationship evolves as Ivy sees Abeille's attitudes changing and begins to want something more for herself as well. Ivy eventually meets Aster, a nonbinary therapist who uses the pronouns Zie and Zer and isn't afraid of touch. Biggs has grown the comic to include many more secondary characters, like Clove, Abeille's coworker who has a speech impediment, and Botan, the foxy head gardener who falls for him. LOVE NOT FOUND may be adorable, but it also touches on concepts of fidelity, intimacy, grief, taboos, societal and familial expectations, ecology, and the ways in which technology both connects and isolates us. It's worth a look for fans of sci-fi romance, gardening, and/or nuanced exploration of physical intimacy in relationships. A note on the rating: This might be categorized as PG-13 by the movie world, but I've given it an R rating because a) I've read some of the NSFW bonus content and b) even though it's not visually explicit, there's a lot of talk (and some subtle depictions) of computer generated orgasms. 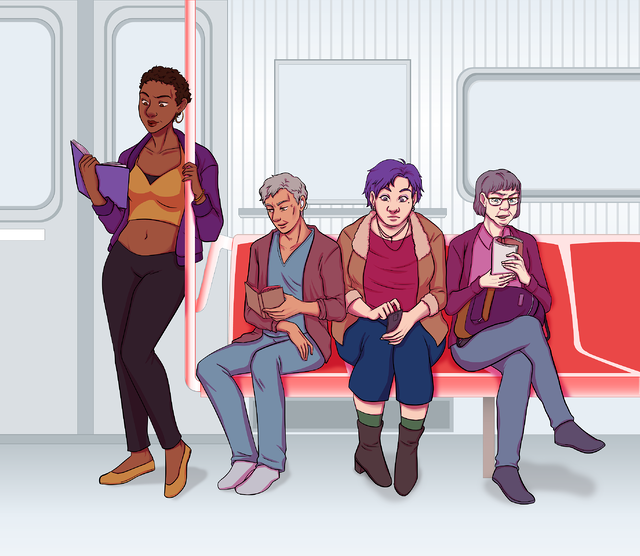 Today we're talking about LOVE NOT FOUND, a sci-fi romance with plants and technology and no human touching.